All Seals’s combination of experienced engineers and analytical capabilities, allows us to provide a full complement of expert services for every application type. Beginning with design assistance, we can analyze your specific project and offer material selection or troubleshooting advice for your demanding application. Material recommendations require expert knowledge of numerous polymers, their physical properties, chemical resistances and more. All Seals will provide you options to choose from, and we’ll always recommend the best material for your particular application. We also provide benchmarking engineering services. Our “SolidWorks” computer aided design (CAD) software is state of the art, which enables us to create solid models. These models can then be used to provide cost analysis data, testing validation, and design replication of competitor products. Simply put, we’ll engineer your project to perfection. 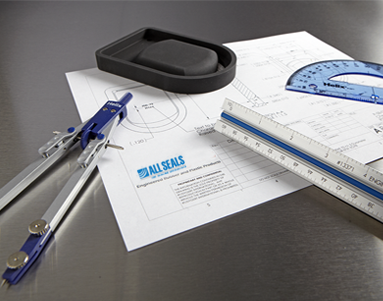 All Seals’s engineering staff is experienced in multiple types of sealing applications. Material selection is a daunting task. Let All Seals's expert staff help you simplify this process. State-of-the art CAD software, specifically SolidWorks, produces solid models and drawings. Reverse engineering services allow our customers to establish best-in-class engineering practices.